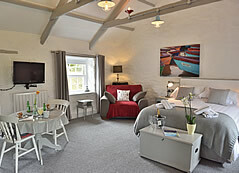 Come and relax in the beautiful Cornish countryside. Chypons Farm is a collection of holiday cottages in a wooded valley, just outside St Ives. Once a farm, these 300-year-old granite buildings have been beautifully converted into four holiday lets and a self-contained B&B suite. Farm Cottage sleeps six people, Waterside Cottage takes up to four guests, and River Cottage and The Barn each have room for three visitors. The B&B Suite is perfect for two. The cottages are arranged around a courtyard planted with cheerful pots and surrounded by mature woodland. Inside, the cottages are individually-decorated and extremely comfortable, with those thoughtful little touches that make a holiday extra-special. On the edge of the village, and down a lane off the St Ives road, this is a peaceful spot. However, you�re just three miles away from lively St Ives (you can even catch a bus 50m along the road), with its art galleries, restaurants and independent shops. You�re also close to Lelant (birthplace of Rosamund Pilcher) and the sweeping sandy beaches near Hayle. The Engine Inn in Cripplesease is half a mile away. It has a cosy bar, and a beer garden with views across the valley. Head south from Chypons, and you�ll soon be in Marazion (home to St Michael�s Mount) or bustling Penzance. Follow the coast road round to the fishing port at Newlyn and pretty little Mousehole; then strike out further west to discover a rugged coastline of hidden coves and dramatic mining ruins. Whether you want to relax on the beach, walk in the countryside, or explore West Cornwall�s many attractions, Chypons Farm is in the perfect central location. Superb accommodation with every comfort. Spotless. Great base for touring especially when you can return at the end of a busy day to such a relaxing and comfortable place to stay. The gardens are lovely for relaxing in and listening to the birdsong. I have no hesitation in recommending Chypons Farm as the place to stay when visiting the area. Excellent all round. Beautifully-appointed cottage in a peaceful location. This is a lovely cottage, and we really liked the tasteful furnishings and the thought that had gone into setting it up for comfort and convenience. Best dog-friendly accommodation I've ever stayed in! The barn itself is very clean, beautifully decorated and everything is of excellent quality. If you're looking for that late availbity break we have discounts of up to 20%, you can only get the best rate when you book direct as no commission is then paid to the online travel agent. Some of our cottages are also available for B&B occupancy, see each cottage for details and get in touch with your dates. Please feel free to call us on 01736 740303 if you have any questions or would like to book.